It's English Tourism Week, so in true RTG style, we thought we’d take you on a tour of our favourite locations across England’s green and pleasant land, starting from our home county of Rutland, in what we're calling The Great English Road Trip. From coast to coast and peak to dale, join us in a two-part expedition across a country we’re very proud to call home. It's up to you how long it'll take you; you could do it all in one go, which we think will take about three to four weeks if you do a whistle-stop tour, or take it slowly and enjoy one leg at a time. The first part will take us from The East Midlands out to Norfolk around London and down to the south coast where we'll make our way into Cornwall and then out again following roads that are almost impossible to describe without sounding too poetic. We'll then head back up to the West Midlands and stop there before heading north to see the rest of England. The south of England is rich and fertile, producing the finest food and wine in Britain and leaving us spoiled for choice. But it’s also wide and deceptively long, so buckle up, we’re in for a long ride. This is one journey we know like the back of our hand. We’ve been travelling from Rutland to North Norfolk every year for as long as we can remember and it’s still one of our favourite journeys in England. As soon as we get out of The Fens and on the coast road there’s a sense of excitement about who’ll be the first to see the sea as brick walls slowly turn to pebbled ones and farmland becomes marshes. The journey takes you along the A47, past Peterborough and out to Kings Lynn where a quick turn to the left takes you wide of Sandringham and on to the seaside. Take the coast road from Hunstanton slowly so that you can get a feel for the villages, catch hold of the Norfolk pace of life and start to unwind. When you get to Wells, make sure to buy some of the fresh local seafood and a stick of rock. We'd recommend camping at Pinewoods. 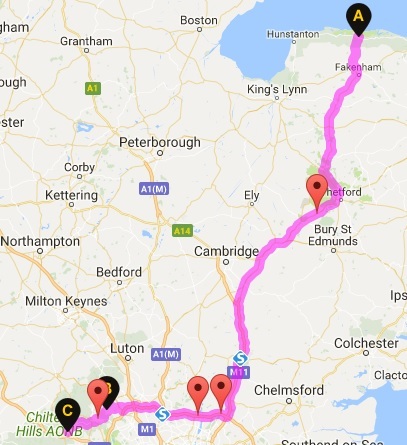 This journey takes you from Norfolk, skirting between Suffolk, Essex and Cambridgeshire and around the north of London via somewhere that we admit we only chose because it has a funny name. But that's what great English road trips are for - exploring new places and finding hilarious signs. We’re not all that familiar with the roads around Suffolk but we’re sure that if you wanted to take your time and amble along the coast there are some beautiful places to visit. With it being a longer leg, we'd suggest stopping at one of the wonderful National Trust sites along the route for a picnic, such as Hatfield Forest. We're a bit starved of the National Trust in Rutland so like to make a point of stopping off if we pass. Spend a night in the Chiltern Hills AONB. This is probably going to be the most unexciting leg of the journey as it involves the dreaded M25 (unless you're feeling adventurous and want to pick out a route cross-country). However, once you get around London and into Kent and the High Weald AONB all will be forgiven. The medieval landscape will guide you all the way to Hastings, crossing land that has played a huge part in the formation of England as we now know it. Castles built of sandstone, reservoirs and historic gardens are all along the trail so make time to stop and appreciate the surroundings before heading to Hastings, our first point of call along the south coast. Following the A27 all along the south coast, this is a leg that will take you across the South Downs AONB , over to the Isle of Wight and back through the New Forest National Park and we'd suggest scheduling stops or detours throughout to appreciate the vast areas of southern England that have shaped the history of England. You're now in deepest Wessex, which defended the South coast of Britain from many, many attacks throughout history. If you download the English Heritage app, you'll see a number of castles and defences dotted along the south coast (and over onto the Isle of Wight), so take your time and enjoy the stories they have to tell. Then head up to the Salisbury area as heritage is high on the agenda for the next stop. 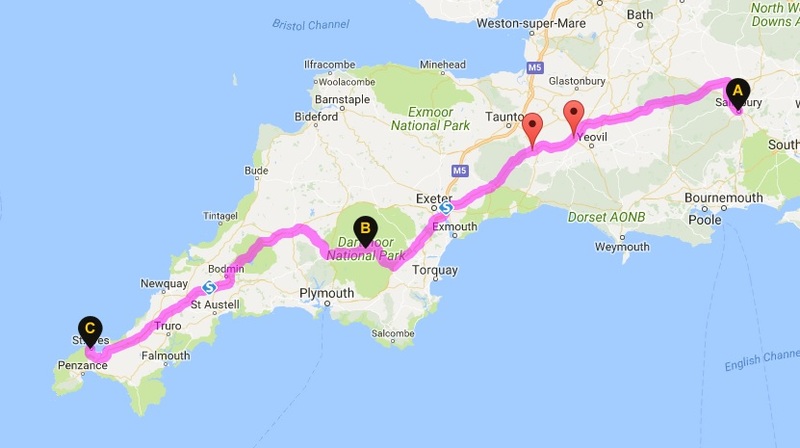 This is a really long leg of the journey, which will take you from the rolling hills of Salisbury, through the English Riviera and into the south of Cornwall, by which time you'll be wondering if you're still in England. So, before you get on the road, visit Stonehenge or Avebury and take in the incredible atmosphere at both sites. Stonehenge has changed a lot in recent years, so we'd recommend booking an early slot before the crowds arrive. But it's celebrating 100 years in the care of English Heritage this year so please support them to continue doing a great job. We can't emphasise enough that, despite the commercialisation of England's heritage or your political viewpoint, we really are lucky to have charities in place that protect our heritage. Then hit the road and head into Celtic country. The direct route takes you straight down the A30, skirting Dartmoor but we've chosen a route that will take you straight through it. In fact, we'd probably spend an extra day/night on this leg and go via Dorset AONB too. Dartmoor, however you approach it, is an incredible sight and you can't help but take it slowly as you wind along country roads that cut through vast plains (and you might even see a pony or two). Then swap scenic countryside for beautiful coastlines as you make your way to St Ives through the heart of Cornwall. This leg of the journey is breath-taking and if you've made it this far without stopping the car to stare in awe at the incredible views and sights around you then you're doing well. But this leg will change that. And we're going to throw it out there - Exmoor is probably our favourite place in the South of England. There is so much to do and see and we'd highly recommend the Tarr Steps as there's a lovely pub that overlooks them, so take your time with this journey. It will take you a couple of days to get the most out of it. We'd recommend stopping at The Deck in Bude for lunch. Trust us. And we guarantee that at some point along the journey you will stop and think "am I really in England?" This is an off-motorway route across The Cotswolds to Cirencester. It does mean skirting Bristol but with some clever mapping you could go via Bath instead and even stop off for a few hours (we know, we know, not rural but SO worth it). The Cotswolds is put up on a pedestal as being stereotypically, quintessentially British (probably because it has such great links to London), however we think that its popularity is also its downfall. While it is beautiful and "chocolate box" England, there are equally beautiful places to visit if you go off the beaten track...and less busy. However, no rural English road trip would be complete without it and since we're here, take in the stunning town of Cirencester and make sure you seek out some of the lovely pubs serving local produce in the surrounding villages. Regrettably, this isn't an area of England we know all that well, however we have written several articles based around the Malvern Hills AONB so they're high on the to-do list. Follow the road west, towards the Welsh border and around Hereford which will take you through lush farmland. We happen to know that the Chase Distillery isn't too far off the beaten track and they do a brilliant tour, taking you through their distilling process from field to glass. From there, head north through the Shropshire Hills AONB to Shrewsbury which is where we'll pick up our journey for leg two... and we're heading north! Megan is the owner of Rural Roots Media, specialising in rural tourism, where her passion for travel, heritage and a great visitor experience inspired her to start 'The Rural Travel Guide'.